Date: Sunday 25 October 2003. It's the start of summer here in South Africa, but the weather's been upside down. 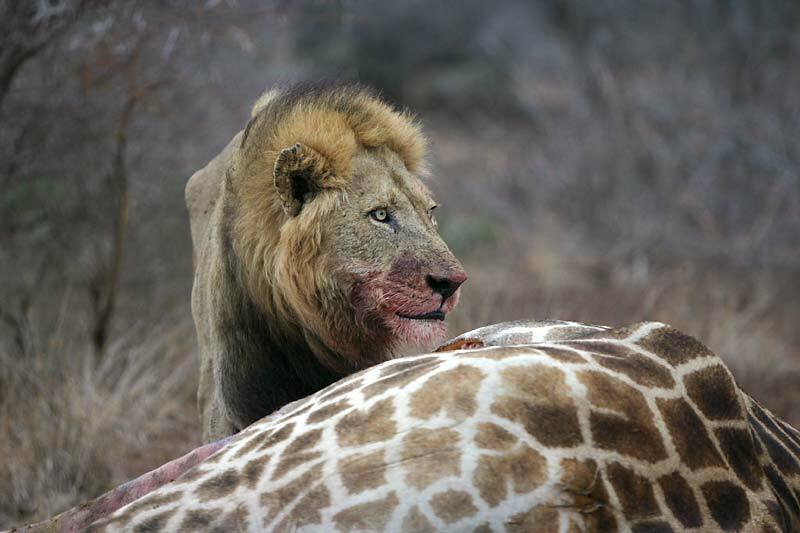 On Friday I returned from a much anticipated trip to the Kruger National Park. For five days it was chilly, wet and windy as a cold front settled like a soggy, dripping blanket overhead. Such weather is not good for photography - the light's bad, raindrops spatter camera lenses and the animals take shelter in whatever thick bush or protected areas they can find. I was particularly disappointed as, two days prior to departure, a new Canon digital camera (D 300/D Rebel) I ordered from Adorama in New York arrived. But there's always an upside and, although the light was dull, there were none of the harsh shadows that make summer photography virtually impossible between 9am and 4pm. Also, in cool conditions the animals stay visible all day, rather than sheltering in heavy shade during the hot periods. We stayed at Satara Camp, an area of the park renowned for good sightings, particularly of lions. And we weren't disappointed. One large pride killed two buffalo fairly close to our camp and then two males brought down a giraffe within meters of the road, providing an ongoing spectacle for nearly four days as they periodically gorged themselves and then kept guard, not allowing any other predators or scavengers to share their bounty. This of course attracted vehicles from all over and at times it was fairly chaotic, with as many as 20 cars parked around the spectacle. The lions, however, appeared unconcerned by all the attention and must have been photographed hundreds of times. After Kruger Park - just as the weather improved - we moved to Kapama Private Nature Reserve for two nights. This calibre of exclusive accommodation is normally way beyond my means. However, I was very lucky to be invited by my boss who, as a supplier of safari clothing to Kapama, had been offered a couple of free nights. 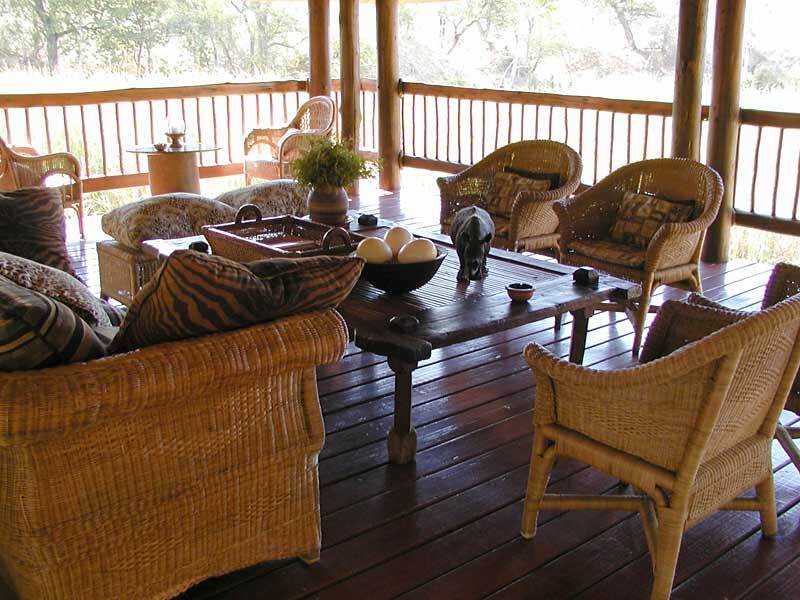 Picture on the right of the tea and cocktail deck at Kapama Lodge typifies the African-themed decor and proximity to the bush outside. In addition to its 13,000 hectare game reserve, Kapama also hosts an Endangered Species Centre. 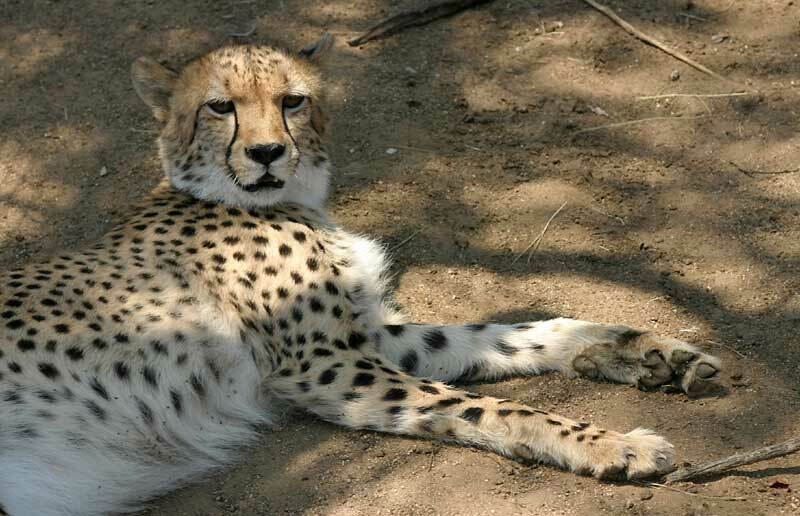 Here we were able to mingle with a quartet of purring cheetah and see, close-up, rare King cheetah, plus Barbary lions and African wild dogs. An amazing experience that I will be expanding on, together with more about Kapama Nature Reserve itself.